How much does a fragrance's "back story" matter to you? I occasionally try to ignore the promotional copy and just smell a new perfume, just experience it on its own terms, but over and over again I fail in that resolution. I love storytelling. I love visuals. I want to know why people create the things they create. Sometimes a description or advertisement for a particular fragrance resonates with me; more often, it causes me to roll my eyes. I had both reactions to the promotional messaging for Mutiny, the new women's fragrance from Maison Margiela. 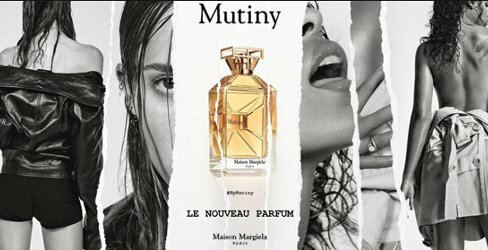 Mutiny was developed by perfumer Dominique Ropion and its tagline is "Assert your self-expression. Banish conformity. Break the rules." In a short promotional video for Mutiny, Ropion mentions being impressed by Galliano's "audacity to subvert, deconstruct and rebuild" traditional clothing forms and wanting to do the same thing with tuberose, which he considers the most beautiful and most complex floral note in perfumery. I like the idea of a fragrance inspired by Galliano's "décortiqué" philosophy of stripping a garment to its core and then re-creating or re-interpreting it in an unexpected, off-kilter way. Does this analogy work? Mutiny includes notes of mandarin, pink pepper, jasmine, orange flower, tuberose, leather, saffron, oud and vanilla. I wouldn't describe it as "mutinous," but it's a pleasing contemporary variation on the theme of tuberose. Ropion has chosen to emphasize the flower's fruity and creamy facets, rather than its indolic side. The greenish citrus introduction seems almost gender-neutral but the more traditionally feminine heart of Mutiny reminds me almost of gardenia as tuberose — it's smooth and a little waxy, slightly "exotic" but still definitely a cultivated bouquet. The saffron and leather notes are more subtle than I expected, but there's a woody-sharp thread of petitgrain that adds interest. Mutiny's dry down is less interesting than its early stages: there's a considerable dose of vanilla, and the composition ends up more generic than it seemed when first applied. Still, this is a good tuberose for people who've never quite felt able to pull off Robert Piguet Fracas or Serge Lutens Tubéreuse Criminelle (myself included!). It has moderate sillage and staying power and, when applied lightly, could even be worn to the workplace. Despite its claims, it's not as inventive as Galliano's actual deconstructed designs for Margiela (his abstracted and highly manipulated trench coats, for example) but it would fit into many fragrance "wardrobes." Fine. I should have stopped there. Then I made the mistake of viewing some short monologues from Mutiny's six spokespeople, a batch of photogenic, Margiela-clad youngsters offering insights like "everyone has something unique about them" and "rebellion comes from within." I'll let you watch some of the videos for yourself, or even read some puff pieces about this fragrance launch, without going into much more detail. Maybe I'm just cranky, but marketing this fragrance to Generation Z seems both cynical and off-target to me. Will Mutiny — still a citrusy-sweet white floral, despite its slightly roughed-up edges — catch on with a demographic of defiant, diverse teens and twenty-somethings in real life? I don't think it will, but then again, what do I know? I've never been much of a rule-breaker. If you've had a chance to try Mutiny, please share your own thoughts in the comments! Maison Margiela Mutiny is available as 50 ($115) and 100 ($165) ml Eau de Parfum at Barneys. I feel the same way as you describe, Jessica. It’s a fine office friendly scent. But it lacks of interest after 10 minutes. Nothing says Galliano or Marigela on this at all. I actually smelled it today (was browsing as usual) and grabbed a bottle of it and sprayed. My first thought was: Ah fun! But then it just went on to be a crowed pleaser and nothing else. I still own and cherish a mini of John Galliano’s fragrance from the early 2000s (the one in the deep purple bottle). That’s more my style! I tried Mutiny a few weeks ago and couldn’t scrub it off fast enough! It sounds nice on paper, but the vanilla-tuberose combo was intensely syrupy-cloying on my skin. Oh no! I found it less cloying than some other recent white-floral launches (like that Gucci thing that was being pushed in late 2018) but I don’t mind a little sweetness. I don’t know why I’m ever surprised anymore when a major brand’s newest scent turns out to be more mainstream than I expected. This one is well done, just not “non-conformist” or whatever else it claims to be! I was wondering about that, too…lol. Maybe it’s for people who *wish* they were slim, edgy, gender-fluid twenty-somethings? !